Go wildlife watching sells Nightvision wildlife action cameras. Go wildlife watching sells Nightvision wildlife action cameras. Go wildlife watching sells Nightvision wildlife action cameras. Go wildlife watching sells Nightvision wildlife action cameras. Go wildlife watching sells Nightvision wildlife action cameras. The CCTV torch recorder is a weatherproof, night vision-capable flashlight that has a built-in digital video recorder that can store up to 32GB of data using mini-SD memory cards. 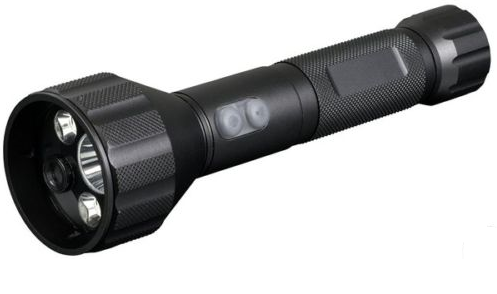 The unit has an optional three-level brightness controlled torch and is housed in a solid aluminum case. It is perfect for discreet monitoring and has uses within security aplications of warehouse, open-air sites and office surveillence. It has a multitude of uses. This is robust well-built piece of high-end equipment. Using a convenient USB interface for video data file transfer, you can record colour video and then transfer it to a personal computer for viewing. The unit features two light levels for close up or long distance recording. Also includes an usb/Car adapter for charging the internal Lithiun battery. 1.5" TFT LCD, the pictures or video play instantly . LED Flashlight , voice/video recorded same time, camera/DV supported . 1*3W LED and 1*1W flash LED, The light distance above 100m at night. Max support 32GB T-Flash Card. Picture flashing,Video flashing turn on, equality in pic/video ,no hightlight point. Support add date or time watermark on pic/video, easy manage.